On Wednesday, from 12 - 3 p.m., student wellness services partnered together on campus for the 3rd annual Just Be Day at Memory Mall. Students participated in wellness activities like yoga, mediation and creating their own aroma spritzers to help relax before finals. There’s a sense of calm washing over Memory Mall. It could be the smell of basil, the bubbles flying all around or the live music playing. On Wednesday, from noon to 3 p.m. at Memory Mall, student wellness services like the Recreation and Wellness Center, and Student Counseling and Psychological Services held their annual Just Be Day. The event focused on giving students a time to relax and feel less stressed about upcoming finals. 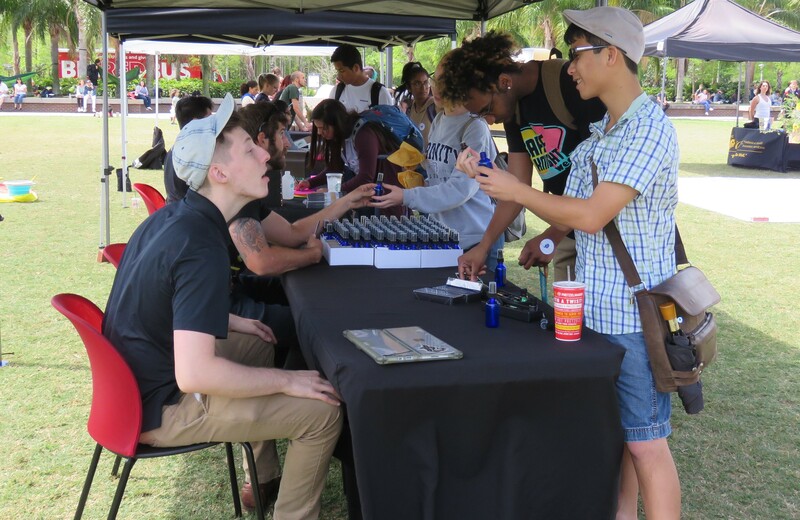 UCF on-campus services had booths with individual activities that helped students refocus on themselves. The RWC hosted mini meditation yoga and meditation sessions and WHPS held a Fresh U cooking demonstration which taught students how to make pesto. All around, more than 300 students attended Just Be Day, an increase from 200 students in the two previous years. For every booth visited, students had a punch card that was punched. By the end, if they had visited all the booths they were able to get a free Just Be Day shirt. Other services like the Arboretum had students plant their own basil to take home and grow. Student Care Services had a banner where students could sit down and color while enjoying the afternoon sun. CAPS had a booth set up to help answer students’ questions about counseling. Students like biomedical sciences sophomore Judith Acosta, attended the event last year and said it greatly relieved stress from her finals which is why she wanted to attend again this year. WHPS also had a booth out that let students create their own aroma spritzer using essential oils. Acosta said it was what caught her eye and made her want to come to the event. The event also included live music from UCF health science alumnus Alex Baron. He played live music at last year’s Just Be Day. He said he understood how stressed students felt when finals were coming up and wanted to help students again this year with his music. To get students to really understand what it means to be “mindful”, Mills said the event is really for students to live in the moment with all the small activities.